We leave for Maine in three weeks! I've been fielding a lot of questions so I'm sharing an FAQ about our upcoming trip. How did you pick Maine? Once we decided to embrace traveling with our kids, we were incredibly inspired by all the possibilities. My heart has been pining for Europe and Greece, but after factoring in the cost of flights, and time zone changes, and our inexperience traveling abroad in general we decided not to embark on international travel right away. For the upcoming year we are staying "local" and focusing on the east coast. While we don't have a lot of experience vacationing as a family outside of the usual summer beach trips and weekend interstate jaunts, we have learned a few things about what works better for us. Andy and I are more relaxed and better able to enjoy the trip when we can keep their eating, sleeping, and playing routines as close to normal as possible. This translates to a need for a similar time zone and access to a full kitchen and living space. We like the idea of staying in one place for a longer period of time so that we can really settle in and get to know a new locality in a more intimate way. We are drawn to the wilderness of the state of Maine and when we found an affordable rental the rest just fell into place. Where in Maine will you be staying? We are staying lakefront about a mile from the coastline, in the mid-coast region. 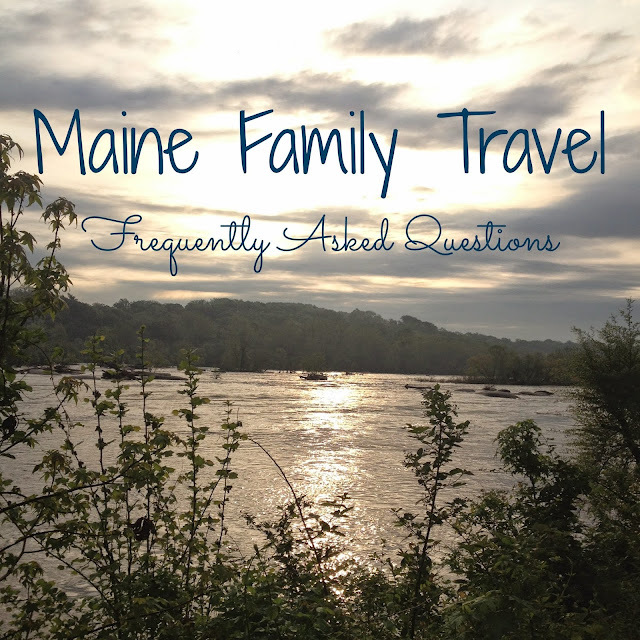 Do you have family or friends in Maine? No! But happily, we do have a few friends who live, or will be vacationing, in neighboring states while we are visiting, so we will look forward to meeting up with them if we can. Are you renting a house or staying in a hotel? We are renting a small cottage that has one bedroom, and a walk-in closet with twin bunks built-in. We will have a full kitchen but will be without a washer and dryer. Are you driving or flying? We are driving. It will take about 11.5 hours each way so we're going to stay the night in a hotel around the halfway point on the way there and back. I'm excited to see the sights as we drive through every state from VA to Maine. How can Andy take 6 weeks off work? He can't! The Spring and Summer months are the busy season and so he will join us for about ten days that will overlap with father's day and his birthday week in June. What will Andy do while you guys are away? I think he's planning to work longer hours, sleep a lot more, and start up a new routine at the gym. Will you have any other visitors? My parents are going to stop in for a long weekend in mid-June, and another set of friends will be joining us for the fourth of July. What highlights are you looking forward to? Because we are staying for six weeks we can explore everything that Maine has to offer at a pretty leisurely pace. The only excursion that we booked in advance is a moose safari that will give us a chance to venture inland for an overnight trip to the mountains. I've made some notes on the kinds of activities that I want to do as we bump into them, but I hope to maintain a relaxed daily routine that mirrors the one we currently keep and that includes good food, lots of downtime, and an outing in the morning or afternoon. We definitely plan to day trip North to Acadia National Park and South to Portland. Oh, and blueberry picking! Such an exciting adventure! I'll be up in Maine (the Sebago Lake,Windham area) with the kids for the last week of June through the 4th weekend too if you want to meet up! I'm thinking we could meet up at a halfway point (or something like that) mid-stay, or a fly by on the way back home in July.The way up is going to be a test run :) I'll pm you!